Players journey back to the 16th to 18th centuries, when nobles and royal families struggled to gain power, influence and prestige throughout the provinces and royal courts of Europe. Players take on the roles of influential families and royal dynasties involved in the quest for power in Britain, France, Spain and the German States. Barons, Counts, Marquis, Earls, Dukes and Princes attempt to gain gold, troops, castles, titles and combat skills in their quest and try to build grand palaces and magnificent castles, in the quest to increase their prestige and perhaps rise to the most powerful position of King and Head of State. Help from the church and the Army will be essential. But beware, for in such a Machiavellian world treachery abounds. Players' nobles must run the guantlet of assassination attempts, the Gallows, the Spanish Inquisition and revolutions. Not even the King is safe from the Axeman or the Guillotine. The player who controls the most nobles and best dominates the various provinces and courts of Europe will win the race for the most Heads of State and be crowned the victor! This is a quality production from the large, disticnctivey coloured, mounted mapboard to the large equally colourful cards and substantial cardboard pieces. 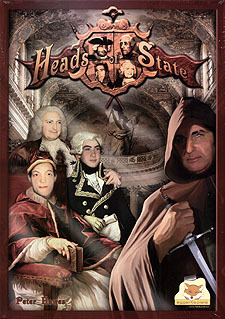 Played over three epochs, Heads of State is at heart a game of area control, as you place your noblemen on the board. To do so you need to collect sets of cards to trade in for the appropriate noblemen. Players collect a range of cards - such as gold, troops, skills, titles, castles, bishops and palaces, and not forgetting the courtesan who can be used in exchange for many of the former cards - to raise nobles, from earls & marqises right up the the most powerful of all, the kings. Sorry no queens in this game. Initially, there is room within the four regions of Britain, France, Spain and the German States for players to seize some element of control without too much direct conflict, but as the board rapidly fills up the style of play changes too. This is because also available for acquisition are assassin cards. Each country has its own brand of assassination cards: the masked axeman in Britain, Madame Guillotine for the French, what else but the Spanish Inquisition in Spain and the German States possess the gallows. These cards are unstoppable, while more readily available generic assassin cards carry a degree of uncertainty in their use. Mayhem soon breaks out and heads begin to roll! At the end of each epoch there is a scoring round in each country and a final bonus scoring for who has acquired the most in each category of nobleman.